The September/October 2013 issue of Horizons is now online at www.aiaahouston.org/newsletter (52 pages in a 6 MB PDF file for its low resolution version). 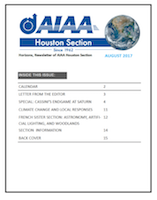 Horizons is the newsletter of the Houston Section of the American Institute of Aeronautics and Astronautics (AIAA). The cover story is, “100 Year Starship Public Symposium,” by Wes Kelly, Triton Systems LLC, and Shen Ge. This issue also contains, “Comet ISON: Bang or Bust?” by Dr. Patrick E. Rodi and an update on our back cover about planning for the Houston Spaceport. That update comes from the Houston Airport System and Professor Larry Bell of the University of Houston’s Sasakawa International Center for Space Architecture (SICSA). This issue concludes with part 8 of 8 of our page by pageP high resolution reprints of the 1952-1954 series of articles from the weekly magazine Collier’s, Man Will Conquer Space Soon! Wernher von Braun led that team of editors, writers and artists.